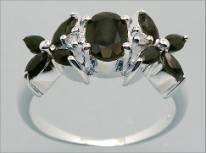 Diana’s Jewels specializes in fine sterling silver and natural gemstone rings. Our rings are beautifully crafted of .975 Sterling Silver and natural gemstones, not enhanced or altered, and include diamond, ruby, amethyst, emerald, sapphire, garnet, blue topaz, citrine, peridot, and white topaz. The retail value of our rings ranges from $85 to $190, but our prices are very low: most of our rings are only $39 and $49. We have almost 60 different styles. About half of them are in stock, ready for immediate shipment to our customers, and will be sent the day after we receive payment. The other half are specially ordered for you, which takes about one week. If you live near our location in North Dakota, we will bring all 60 styles to your home so that you can try them on and see them in person. You can order jewelry from us by mailing a check or money order, or order instantly using PayPal online payments. Our shipping charges are low: $1.50 for the first item and 25 cents for each additional item. We require $1.35 insurance for our genuine gemstone rings, but if your order is more than $50, we will pay the additional insurance for you! Click here to view all our rings in a thumbnail gallery.